I Want Living Bird Digitally! 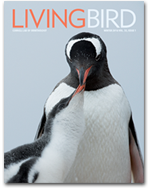 Please check if you prefer to receive only the digital version of Living Bird magazine. Please only click "Donate Now" once. If you have selected the option for monthly donation, future transactions will occur automatically on the same date every month as your first gift. If you have any questions, call 866-989-2473. This solicitation is intended for individuals living in the United States.